It’s been months, perhaps even years of sleepless nights, false starts, and failed attempts. Finally the dam breaks and your loved one is on their way to treatment. You breathe a sigh of relief, thinking the crisis has ended; and for the most part it has. But while acuity of the disease has been triaged, the work to dismantle the destructive dynamics that exist where every form of addiction is found has merely just begun. Whether this is a loved one’s first treatment or they have been through multiple programs, family involvement is essential for both the patient and their family. Here are the seven main reasons why. 1. Addiction affects everyone: You included. Attempts to try and control the addict’s behavior leave spouses, parents, and siblings exhausted. The trauma of late night phone calls and missing person reports has a profound impact on the family’s emotional and physical well-being. Throughout the chaos of addiction, there’s little time or energy for the family to focus on how they’ve been impacted. Family therapy in treatment provides a safe place for family members to begin to look at how they have been affected and the role they’ve played in the addictive process. 2: Every family member needs help: You included. Looking at family involvement in treatment as a way for each family member to heal can help to address the profound impact addiction has had on your family. Each family member deserves his or her own healing process. Years of distress, pain, and guilt can begin to subside. 3: Family increases positive outcomes: Your family included. 4: Letting go of guilt: Yes, that’s your guilt. Family members live with a tremendous amount of guilt. This guilt stems from the family questioning their role in “causing” addiction and/or actually being blamed by their loved one. Common accusations such as “If you didn’t nag me all the time I wouldn’t drink” or “It was your bad genes that made me an addict” serve to reinforce these feelings of guilt and shame. Family involvement is an essential step in freeing family members from these overwhelming feelings of responsibility for their loved one’s addiction. Families are provided a forum where they can finally have a voice that is heard and where they are supported by peers and professionals to find forgiveness for themselves. 5: Family responses can play a role in relapse: Yours included. While family members are not responsible for causing their loved one’s addiction, a lack of understanding and social support can leave the family in the dangerous position of feeding into the relapse process. Families develop a conditioned response to the crisis of a loved one in their addiction. Many behaviors that are exhibited by someone in early recovery can be triggers to the family, bringing back feelings of fear and anxiety. The reality is that these behaviors and emotional relapses on the part of the addict are essential to that individual learning to rely on their own support system and emotional controls. Families who lack the support and knowledge of how to recognize the warning signs, and allow this process to happen, can find themselves rescuing their loved one from the very events that could help them solidify their sobriety. 6: Families don’t communicate effectively: Yours included. Communication problems in addictive families create challenges, as a result of each member not knowing what’s going on. Family Therapy, in the course of the patient’s treatment, provides a structured and supportive environment for these misconceptions to be discussed and reconciled. In an effort to not “make matters worse” families will walk on eggshells about traumatic and painful events in the family history. Failure to engage in dialogue about these events can leave people feeling resentful or anxious about how other family members perceive them. 7: Understand how to support your loved one: Yes, that’s you. 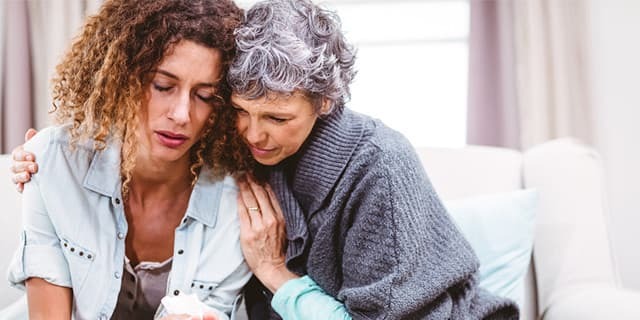 From my extensive experience, families who are reluctant to participate in a loved one’s treatment greatly limit the family’s chances of success. It is easy to continue to point the finger at the patient and say, “the addict needs to get their own act together.” While this statement is true, it ignores a large piece of the puzzle. This piece includes you and the rest of the family. You have invested so much energy thus far; take this opportunity to continue to heal by investing in the family’s recovery. It’s an investment of time, energy, and money that if done right, will pay out dividends beyond your wildest dreams. In my experience the greatest predictor of success for the patient is the magnitude of change that the family is willing to make.